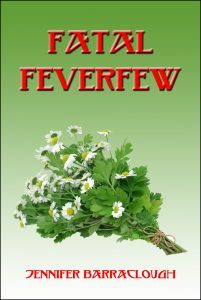 Fatal Feverfew is set in an isolated healing retreat in the west of England. Lucia, accompanied by her husband and cat, arrives there to recuperate from a recent illness only to find that she is suspected of poisoning their hostess. Lucia reluctantly takes on the role of detective and, with the help of the local doctor, succeeds in uncovering the true course of events and winning her husband’s respect. With echoes of the old-fashioned country house murder mystery, Fatal Feverfew is one of three medically themed novels written by Jennifer Barraclough in the 1980s but not published until thirty years later. Drawing on her experience in psychiatry and general practice, it takes a gently satirical approach to the serious themes of illness, marital disharmony and unnatural death.